At the end of the semester, we headed back to the States to finish school. Alex returned to Northern California and I to Upstate New York, but we kept in touch. I would visit him in Berkeley, where we would host lavish (by broke twenty something standards) dinner parties and tool around the Marin Hills. Alex would come to New York City for long walks and down and dirty Chinese food. For a few glorious years, Alex moved to Brooklyn, but the Bay Area called him back for a PhD in Urban Planning. After a stint in Paris, Alex recently began working as a Lecturer in Geography at Leeds University. Somewhere in the eighteen years since we first met, it seems that we became adults. Fretting over the health of his students, Alex asked whether he might contribute a post or two. The recipes that he offers below are as suitable for starving college students in England as they are for an overworked New Yorker who finds herself suddenly pushing 40. 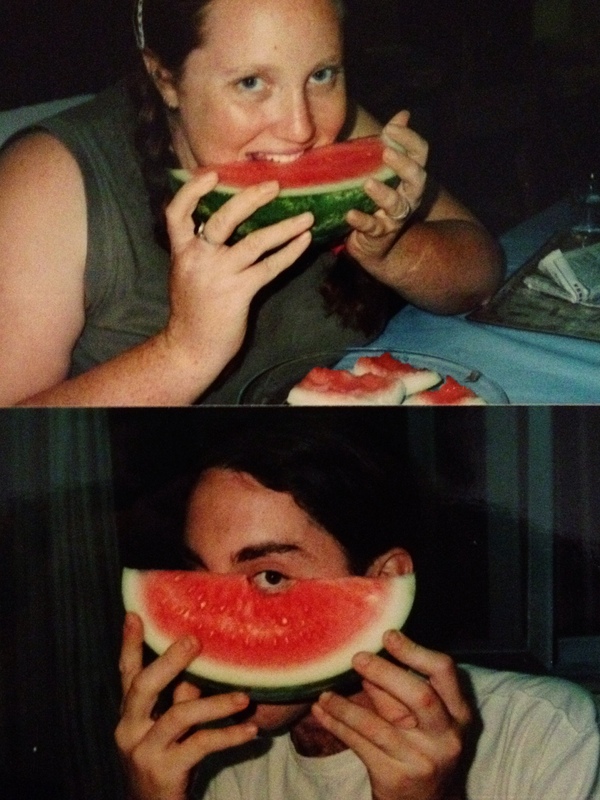 Now that the Drunken Fig is required reading for my first year tutees (the Jewish grandmother in me worries that they aren’t eating well), it seems time to contribute some of my favorite tricks for brilliant eating on the simple. This is a super technique for the harried life, very friendly for finicky children/housemates/lovers. It also makes multiple meals at once or a classy two-course. Remove your hard-as-a-rock frozen chicken parts from freezer. Works with all types of frozen bits–light, dark and turkey too. Place in decent size pot – big enough that you can cover with water thoroughly and boil the hell out of it. I like to add a little salt at this stage, and sometimes a of bay leaf or some oregano, depending on what I am doing with it (see below). When your chicken is fully cooked, turn off the heat, and use tongs to remove the chicken pieces. Place them on a wooden cutting board or something that can take the heat. When the chicken is cool enough to work with, take a fork in one hand and the tongs in another. Hold the chicken bits with the tongs, and press down and to one side with the fork to shred the chicken. The longer you cook it, the easier it will shred. But the meat will also be a little drier and less flavorful. This takes a bit of getting used to, but you will get the hang of it. Place your shredded chicken in a bowl. Now you have two awesome ingredients: a ton of shredded chicken and some fresh chicken broth. So what do I do with my poultry bonanza? Tacos now, soup later option: Mix some olive oil, a touch of salt and pepper, plenty of oregano and a bit of chili powder into the chicken. You can do garlic instead of chili, or both if you like. Heat up tortillas, sprinkle on some cheese (or not, if you want to be traditional), a touch of cilantro and onions and voilà. Freeze broth. Dinner tonight, tomorrow’s dinner cooking while you eat: Use the chicken how you will. (Last night it was with garlic spinach over brown basmati rice.) Before you sit down, chop up a bunch of veggies. If you can stand waiting a bit for dinner, a light sauté is generally recommended for the veggies, but it’s not essential. Let the soup simmer while you eat. By the time you are finished, the soup will be ready for pureeing – if that is your way of doing things. Now tomorrow’s dinner is done, save for the hard-crusted bread. Soup and chicken together option: Take a can of black beans, and purée it in the chicken broth with some garlic, a touch of cumin and some oregano. Serve with heaping amounts of chicken, a dollop of sour cream for sluttiness and a touch of cilantro, unless you hate it. Works with other beans and pretty much any leftover veggies you have. The simple two-course option: Shredded chicken takes almost any sauce and any cuisine well. I have done Japanese style over noodles and then added a touch of miso into the broth for a new take on miso soup. Sautéed vegetables and chicken over couscous with a vegetable soup is also excellent. Quinoa and chicken with a broccoli soup. Ad nauseam. The top class Mexican meal: Since this method is inspired by Mexican and Salvadoran cuisine, they get the top class version: Chicken enchiladas with a roasted corn and tomato soup. Actually pretty easy, especially if you cheat and buy enchilada sauce. An hour later (though, in hindsight, 45 minutes would have been sufficient), I was shredding the meat. I threw the bones and skin back in to simmer while I did some work. 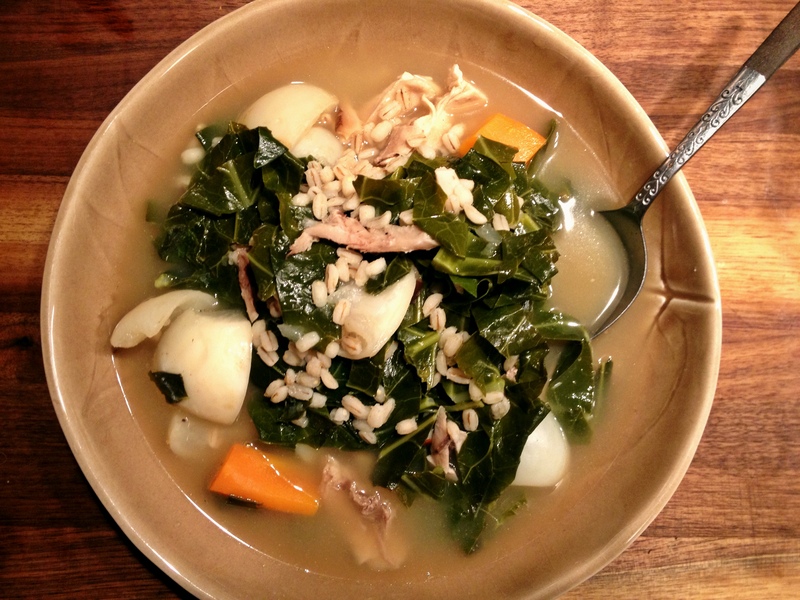 After another half hour, I strained the broth, put it back on the heat, and added turnips, shredded collard greens, carrots, dried porcini mushrooms, pearled barley, red pepper flakes, salt and pepper. Half an hour later, I mixed in some of the shredded meat and dinner was served. Thanks, Alex, for taking care of me across the many miles. 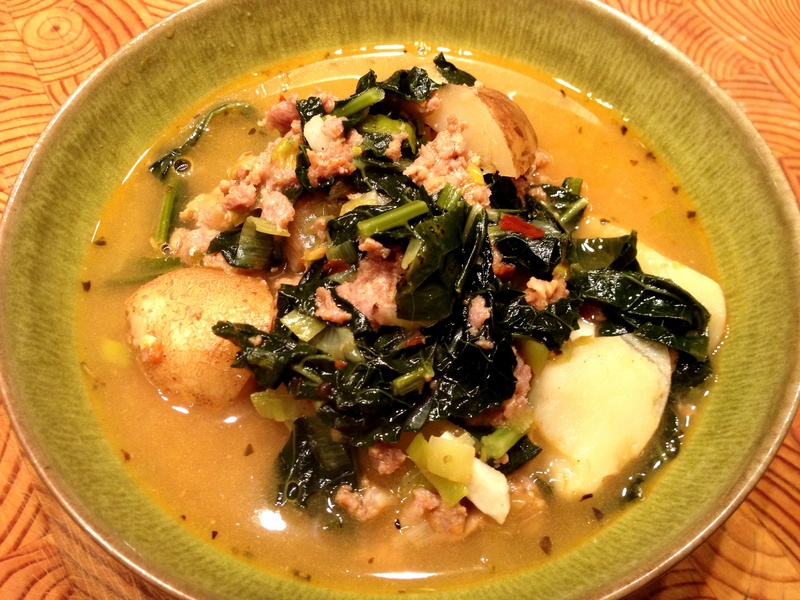 This recipe was inspired by caldo verde, a traditional Portuguese soup of kale and potatoes garnished with spicy sausage. While caldo verde is usually served for celebrations, I was able to whip this up in under an hour with ingredients I had on hand, making it a fine midweek supper. The ingredients are simple and the recipe is straightforward, but the resulting dish is delightfully complex. Bring the oil up to medium heat in a large dutch oven. Add your sausage and stir until cooked through. Add the leeks and garlic and cook until limp. Stir in the herbes de provence and red pepper flakes. Let simmer until the potatoes are tender, approximately 30 minutes. Barbara and I met through our mutual support of the New York Abortion Access Fund (NYAAF). 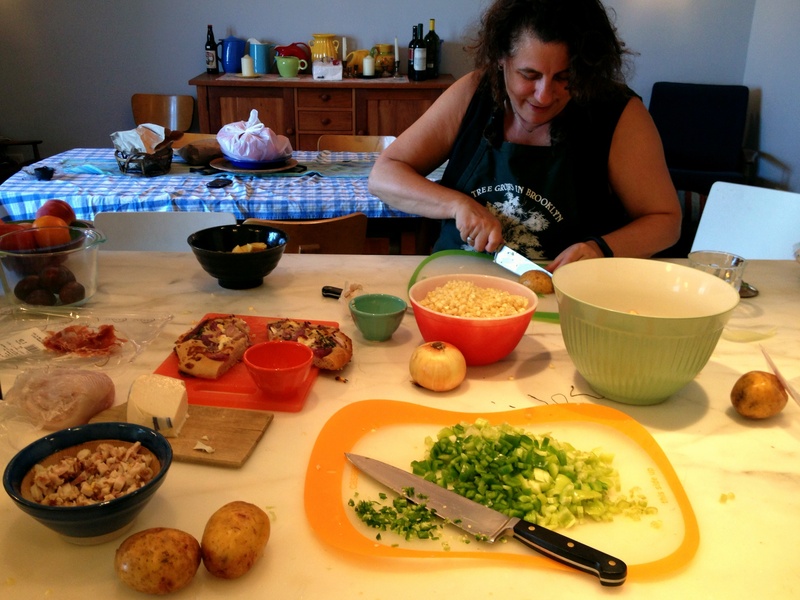 This past spring she invited me to be a guest on the Park Slope Food Coop cooking show that she hosts. We had a great time making shrimp and grits and discussing the critical role that abortion funds play. A couple of weeks ago we decided to reprise our cooking date–only this time (mercifully) the cameras were off. Barbara emailed me a few days before our date asking what we should make. I mentally reviewed the various foodstuffs cluttering my fridge: corn, potatoes, and a wide variety of peppers. This could have gone any number of ways. Then I remembered that I had several corn cobs stripped of their kernels jammed into my freezer because I had read something about corn broth. Bingo! Husk the corn and then strip off the kernels using a sharp knife. (I find that doing this over a shallow bowl keeps the kernels from rolling away and also allows me to capture any of the milky liquid that they exude.) 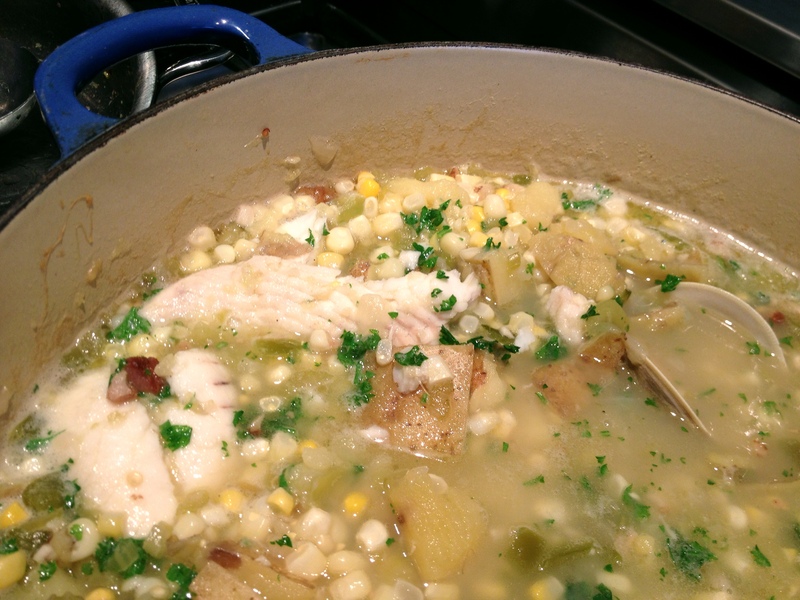 Reserve about four cobs’ worth of kernels for your chowder and freeze the rest for succotash, cornbread or the like. 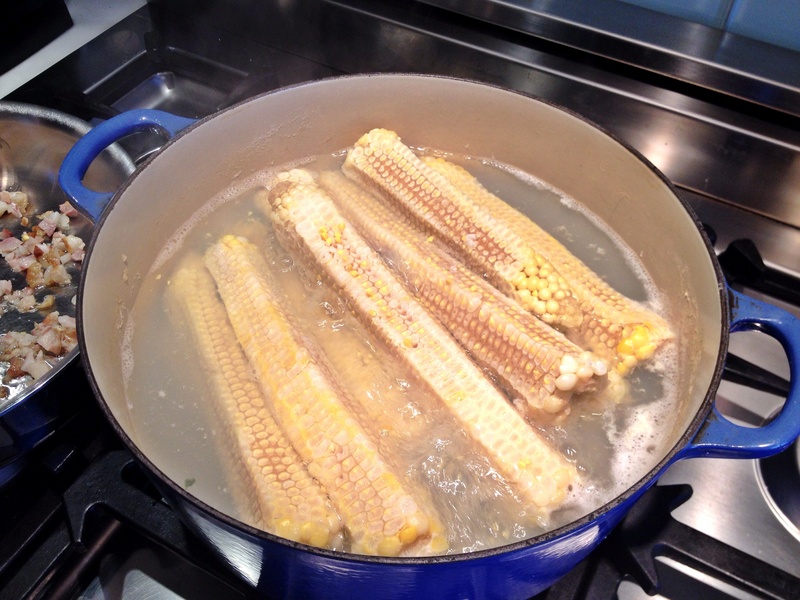 Throw the denuded cobs into a large pot with enough water to cover, bring to a boil, reduce heat, and simmer for half an hour–or as long as it takes you to get through the next couple of steps. 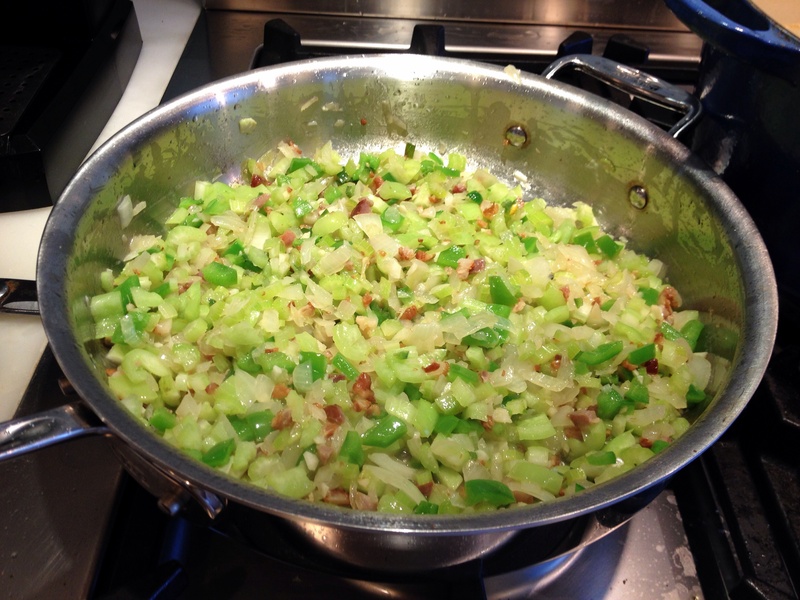 Dice your bacon, onions, celery, and green peppers. Mince the garlic and jalapeño. Chop the potatoes. Chat about anything and everything. Have a nosh if you like. Add the bacon to a large pan and bring up to medium-low heat. Once the fat has mostly rendered and the bacon pieces are just starting to firm up, add the onions. Saute until they are starting to soften and then add your celery and various peppers. Once these have started to soften, add the garlic and cook for a few minutes. The key is to soften everything up without allowing it to brown. Season with salt and pepper. Pull the corn cobs out of your soup pot using tongs and then dump your vegetable mixture into the pot along with the diced potatoes. Add the lobster stock or clam juice, bring to a boil, and then lower to a simmer. Put the clams in a bowl, cover with cold water, and add some black pepper or cornmeal. (This step, while not strictly necessary, will encourage the clams to spit out their sand, avoiding a certain amount of grit in the finished product.) Leave the pot to simmer for a half hour or more while you retire to the living room for some more chatting. Now is a good time to wake Barbara’s husband Chris up from his nap so that he can ready himself for chowder. Add the butter. 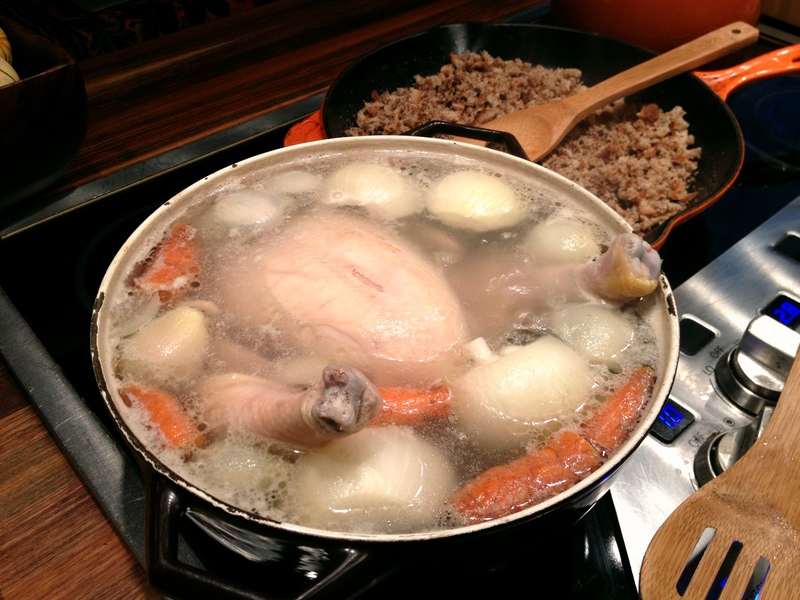 Taste the broth and adjust the seasoning with salt and pepper. Add your clams and then lay the flounder in gently. Cook until the clams pop open (roughly 15 minutes), by which time your flounder should be white and opaque. Finish with the corn kernels and some fresh parsley. 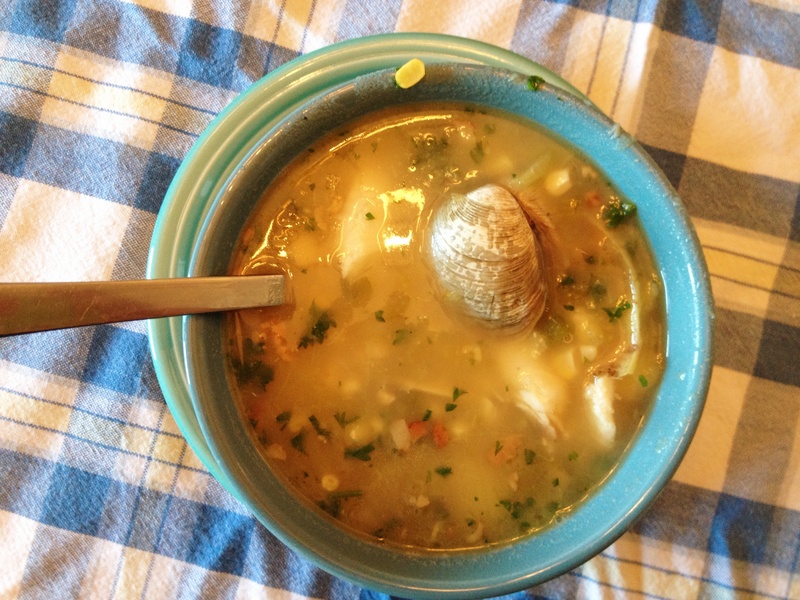 We ate our chowder in Barbara’s rather perfect Fiestaware bowls, using hunks of bread to soak up the delicious broth. It made for a truly excellent early autumn lunch. I recently had the opportunity to tape a television show discussing two things I am passionate about: home cooking and abortion access. The Park Slope Food Coop produces The Coop Cooks, a show that airs on Brooklyn Cable Access Television and is now available online. The host, Barbara Kass, invited me on to talk about the New York Abortion Access Fund (NYAAF), a cause that is close to both of our hearts. In fact, Barbara and I first met at NYAAF’s annual bowl-a-thon. The National Abortion Access Bowl-a-Thon is an amazing example of grassroots fundraising–and a whole lot of fun. Sometimes as little as $25 separates an individual from accessing abortion services. NYAAF and a network of funds across the country bridge this gap, ensuring that choice is a reality for everyone. To see me talking shrimp, grits and abortion access, click on the image below. 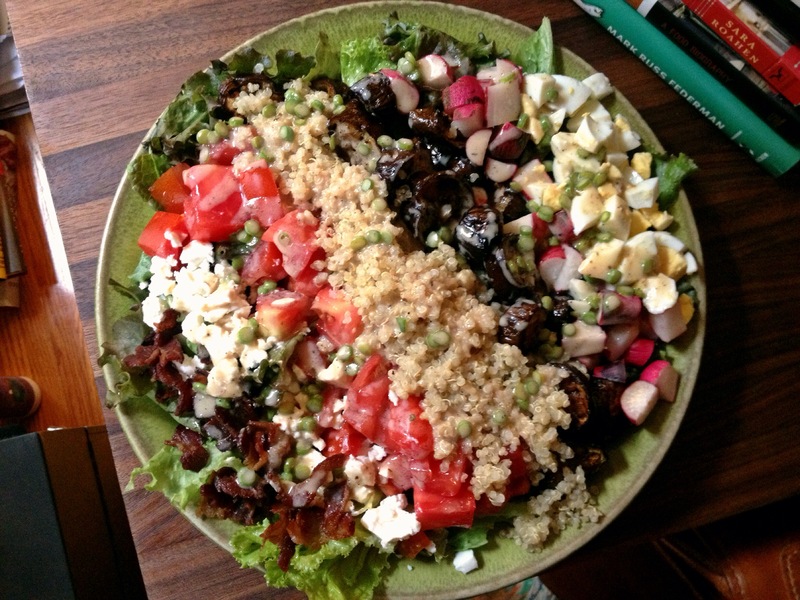 Top a bed of lettuce with hard-boiled egg, radishes, roasted eggplant, quinoa, tomatoes, feta and bacon–or whatever else you happen to have on hand. A little red wine vinaigrette and you’re good to go. I’m working from home today in a desperate bid to focus on the 300-page curriculum that needs to be edited by Friday. Fortunately, I picked up a new stash of CSA vegetables last night, so I had plenty of food on hand for my working-from-home lunch. Thoroughly rinse the quinoa, add two cups of water, and bring to a boil along with a good pinch of salt. 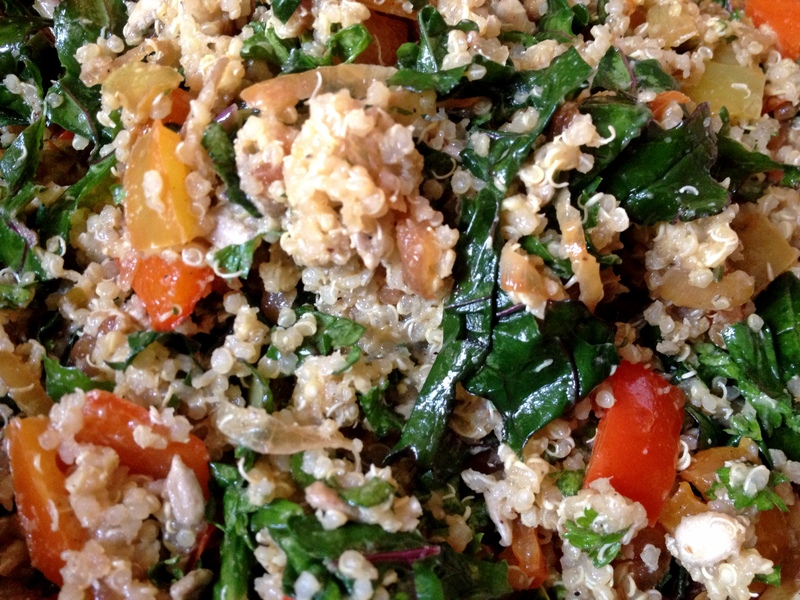 Lower heat and simmer for 10-15 minutes until quinoa is tender and water is absorbed. Heat 2 tablespoons of the olive oil in a cast iron skillet over medium low heat and add the onion, stirring frequently until soft and starting to brown. Then add the garlic and cook for a few more minutes before adding your peppers. Cook until the peppers are tender but still firm. Turn off the heat and add some salt and black pepper. Whisk the Dijon mustard, white wine vinegar and some black pepper in the bottom of a large bowl. Gradually whisk the remaining two tablespoons of olive oil into your dressing and then add the kale, stirring to ensure that each piece is coated. When the kale is just starting to wilt and the quinoa, peppers and onions have all cooled a bit, mix them together along with the parsley and sunflower seeds. Let sit for 20 minutes or until you need a copyediting break. This recipe makes enough for three or four lunches and is perfectly happy to marinate for a few days in the fridge. Double it and you’ve got a great contribution to a potluck picnic. I threw some halved cherry tomatoes on top for my lunch and may add some feta cheese when I have it for dinner.